Did you know that roughly half the food Americans send to landfills annually could have been composted? This equates to roughly just over a billion tons of food worth about a trillion dollars. Compost is the product of decomposing organic matter, that is often used to enrich the soil with nutrients and help your plants grow as healthy and strong as possible. These discarded items can be put back to work via composting to nourish your garden. Compost enriches soil that can help grow healthier produce and flowers. It can make plants more resistant to diseases and may improve the flavor and nutrition of produce. As compost promotes a healthy soil microbiome (fungi, bacteria, and other microbes that break down decaying matter), gardeners sometimes lovingly refer to it as “black gold”. Outside of improving the nutrients in the soil of your garden, composting can help reduce your carbon footprint and in turn, fight climate change. By diverting food waste towards composting, we close the nutrient cycle and can decrease the production of methane gas — a byproduct of food waste decomposing in landfills — instead, nourishing soils, protecting against erosion, and reducing fossil fuel consumption from waste transportation. Methane has a warming potential (defined as a relative measure of how much heat a greenhouse gas traps in the atmosphere) of roughly twenty times more than carbon. More nutritious produce, more vibrant flowers AND turning around climate change — wins all around 🙌🏼. Lots of people! Everyone from Martha stewart to the Obamas to James Bond (Pierce Brosnan version). Even Oprah set aside an area on her Hawaiian farm estate for composting. You’re sure to be in great company! Composting can be done cold (let it sit and do its thing over the course of a year) or hot (introduce heat to speed up processes to a few months). We will leave the latter up to the gardening professionals and focus on the former. 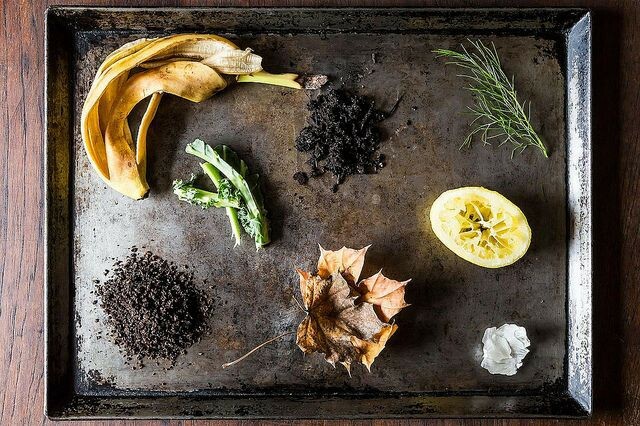 Compost can be purchased or made at home; as we are DIY enthusiasts here at GROW, we’ll walk through the steps of setting up your own compost at home. In a bin/container of your choosing, such as this countertop wood one or this retro looking steel caddy , mix “greens” (mostly wet materials from the kitchen and garden, that are rich in nitrogen) and “browns” (mostly dry materials from trees, that are rich in carbon) with a dash of soil to introduce organisms that will accelerate the process. Feed your compost with organic materials (ie: fruit and vegetable trimmings, plant, leaf, and grass clippings, egg shells, coffee grounds, fruit peels, hair, cotton, etc.) but avoid inorganic materials and items such as pet droppings, greasy materials, meat, dairy, and diseased plant materials. You’ll know when the mixture is ready when it smells like earth and is dark brown. The process can take anywhere from a few months to a few years. The compost mixture needs carbon, nitrogen, air, and water to keep going. Aerating the mixture about once a week will keep unpleasant odors at bay. Keep an eye on moisture; too much water and your mixture will start rotting instead of composting. Add more greens when mixture is looking dry. Add more browns when the mixture is looking too moist and/or smells. City dwellers can keep scraps in freezer/fridge (no meat/dairy) to prevent odors and when they’re ready, bring it to community pick up centers designated by the city’s compost collection programs. Alternatively, vermicomposting (vermi = worms) can be done in small spaces; this is what we have at GROW HQ in New York City. Earthworms (usually Red Wigglers) eat and process the food, adding even more nutrients into the end product and minimizing odors. When the compost is finished, we top off our Duo to keep our vegetables thriving. Those blessed with outdoor space can keep their compost bins outside or even designate an area to it. © 2019 GROW Labs Inc.